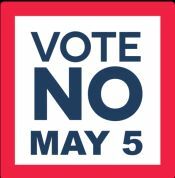 The Socialist Party of Michigan encourages all working class voters of our state to reject the proposed new road-maintenance funding scheme in the May 5, 2015 statewide Special Election (Proposal 15-1). In response to rising corporate investment concerns over the crumbling state of Michigan’s road conditions, the state legislature’s Proposal asks voters to approve a constitutional amendment to authorize raising the state sales tax from six to seven percent, as well as an additional net increase in motor fuel taxes. Without even considering any rollback to the state’s 86% corporate income tax cut, let alone any reduction to the 20% of general fund dollars allocated to the state’s prison system; the legislature has crafted Proposal 1 with the intent of further saddling the state’s working class and poor with an even greater disparate share of the state’s tax burden. According to current figures from the Institute on Taxation and Economic Policy, the average cost of sales and excise taxes already amounts to 5.1% of household income for Michigan families in the lowest three-fifths of the income range — and 6.2% of household income for families with incomes in the bottom one-fifth. By contrast, the average percentage of household income paid in sales and excise taxes by Michigan families in the top one-percent of the income range amounts to a mere 0.8%. In effort to wheedle support from low-income voters, the Proposal would also restore the state’s earned income tax credit to its pre-2011 percentage level. Yet, in at most providing an offset to the accompanying sales and fuel tax hike, the net effect of the state’s earned income tax credit reduction would still essentially remain unchanged. Thus, far from reflecting any intent to mitigate low-income workers’ disparate share of the state’s tax burden, the Proposal is truly aimed at adorning such an imbalance with the badge of state electorate approval. The Socialist Party of Michigan’s Platform calls for a steeply graduated state income tax to fully replace the state’s regressive sales and fuel taxes, as well as the complete cessation of all private corporate tax breaks and subsidies. Ultimately, we further call for the creation of a massive social surplus to fund Michigan’s public service and community needs through the socialization of the state’s major industries under a democratically planned economic framework. In order to move beyond the constantly recurring need for band-aid surface fixes, we also call for a significant enhancement to the durable quality of road repair surface-materials—distinctly specified to Michigan weather cycle conditions, as well as the development of ecologically sound alternatives to salt-based snow removal. Furthermore, we call for the wide scale expansion of viable alternatives to roadway-vehicle travel through the development of fully-funded high-speed rail transit systems connecting Michigan’s major cities. There can be little doubt that the public message sent by Proposal 1’s approval would further embolden legislative efforts to push through other similarly regressive measures, if not also further attempts to leverage the status of public-benefit reductions as a means to elicit voter-acceptance of other future class-targeted attacks. In view of the Proposal’s main objective of shielding the rich from any felt share of the state’s infrastructural maintenance expenses, and correspondingly entailed ratification of the state’s regressively disparate tax burdens, Proposal 1 is altogether no less intolerable than the current conditions that it is framed to address. This entry was posted in News, Statements and tagged Elections by spmichigan. Bookmark the permalink.